Ralph Lauren introduced Polo in 1978. It is the result of the following top fragrance Notes: basil, juniper and cumin. The middle notes are: thyme, pine and carnation and the base of the fragrance is: amber, patchouli and moss. Polo is recommended for formal use. 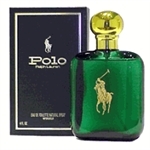 I have purchased Polo cologne at your store for my husband. It would be nice if you offered the Polo Aftershave as well. Best men's fragrance ever! I'm in heaven when I detect this scent. Although there are other nice men's fragrances, this one rocks my world.